Sols 2315-17, February 11, 2019, update by MSL scientist Suzanne Schwenzer: Curiosity is driving across the clay-bearing unit, which is still a very new terrain with many details yet to be understood. The region is covered in little pebbles – and has lots of small sand patches, too, both of which we continue to investigate. 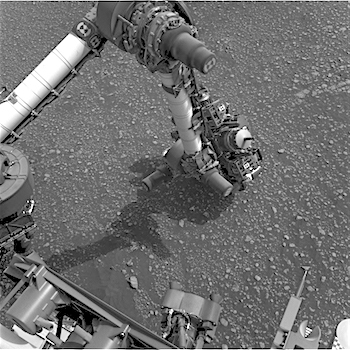 The Navigation camera image above shows the APXS being deployed on the sand patch Alba that was investigated on sol 2313. After that, the drive took us a little further north, to be exact, Curiosity drove 39 metres from the last location. This entry was posted in Reports and tagged Aeolis Mons, Alba, CBU, clay-bearing unit, Curiosity, Dauntless, Emerald, Faoilean, Gale Crater, Glen Torridon, Mars Science Laboratory, Mount Sharp, MSL, Murray Formation, NASA, Osprey, Otter, River Brora, Thistle. Bookmark the permalink.